Danny and Tate are a happy couple with everything they could possibly want except for a child. When they decide to look for a surrogate to carry their child Danny's mom decides to become involved in the process despite living thousands of miles away in Taipei. 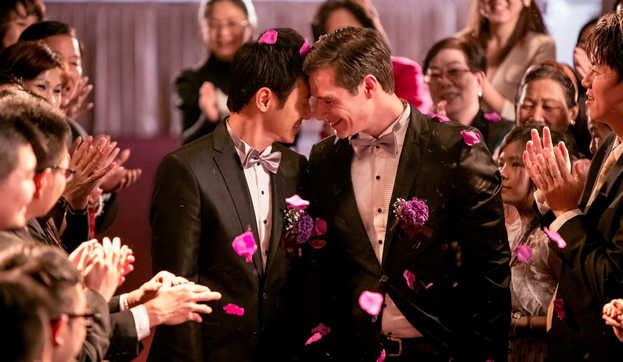 Barney Cheng has made a very good little film dealing not only with issues of surrogacy for a gay couple he also deals with the how traditional Chinese parents deal a child who is gay. Grace Guei playing Danny's mom shows reveals a depth of character that is often lacking in similar roles in similar films. She wonderfully portrays the mix of emotions of loving her son, confusion about what this all means and uncertainty about her son's boyfriend. Its a tough juggling act and Guei pulls it off beautifully. Michael Adam Hamilton is also really good as Tate. He deftly shows the tricky line of loving his spouse and having a wave of uncertainty about their family who doesn't quite accept or understand them. While not perfect, Cheng doesn't quite blend some of the humor and drama as he should with some of Danny's mom's behavior playing as awkward, the film still manages to be affecting and by the end of the film I was wiping a tear away from my eye. BABY STEPS will be released in the U.S. and Canada via Gravitas Ventures on August 15th on DVD, Blu-ray and VOD and across digital platforms including iTunes, Amazon, and Google Play.